I live on a mountain. 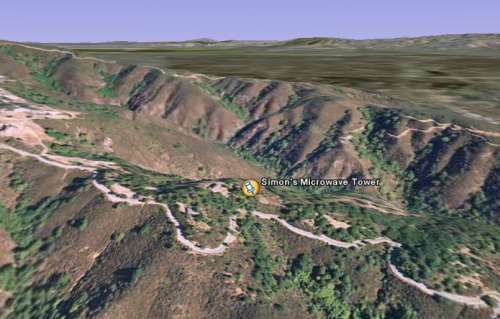 I get my high speed Internet by using a microwave link from a tower on the hill near the house to the top of a tall building in San Jose, a distance of about 11 miles. Since that link provides me with much more bandwidth than I actually use, even when streaming video from my henhouse, I give free Internet access to those of my neighbors who don’t have line-of-sight to San Jose. Some of the links are what we call “wires through the woods”, but several are WiFi links, using directional antennas and Linksys WRT54G wireless routers. Our longest link is 2.89 miles, to a house across a canyon from me, on another ridge to the east. But just for fun, I set up a dish aiming at distant Fremont, and put another dish on the lumber rack of my pickup truck and drove to a hill above that city and parked on the side of the road, aimed my dish towards home, and got a solid signal at a distance of a little over 26 miles as the crow flies. I was getting a nominal 5.5 megabits per second at that distance, which allowed me to get actual measured throughput of just under 3 megabits per second. Surfing the web was still plenty fast enough, and what delay I was seeing was the normal server delay. I could not really tell any difference, subjectively, from surfing at home. I would have gone farther, but I had run out of road. Back home, I drove to the top of the mountain, and aimed my dish around at various parts of Silicon Valley and beyond, and used the NetStumbler program to find access points. At one point, I was able to get a signal from a transmitter in Oakland, about 45 miles away. I was feeling pretty proud of myself, with my truck mounted 24 dBi microwave dish and my 300 milliwatt WiFi card in the laptop computer. Then I read about some guys who went just under 125 miles using 300 milliwatt cards in their laptops, feeding 10 and 12 foot parabolic dishes — one towed on a trailer. As I had found in my own experiments, the hard part is finding two places within line-of-sight of one another that are far enough away to make the project interesting. These guys set up one dish on a mountain in Nevada, and then drove into Utah. To get farther than mountaintop to mountaintop, some Swedish folks put a WiFi unit in a balloon and sent it up to an altitude of over 18 miles, and received signals from it as far away as 195 miles away. They used a 6 watt amplifier, since a 12 foot parabolic dish is a little heavy for a weather balloon to lift, and somewhat hard to aim. Years ago I used my amateur radio equipment to talk to astronauts in the Space Shuttle and International Space Station. There are amateur satellites in orbit that store and forward email to amateurs around the world. WiFi and satellites are already connected to provide Internet access to recreational vehicles. It seems to me it is only a matter of time before a low earth orbiting WiFi access point breaks all earthly records for distance. Small scale Jurassic Park » « Can you see the Milky Way?